Today is International Women’s Day, and the day of the general strike by women. I seriously considered taking down Critiki and Ooga-Mooga for the day. Honestly, I don’t want to. I love what I do too much to hide it away. I understand that it could be a strong demonstration to take them down, and make their absence felt, but my desire to remain available for you to use is too strong. What I want to do is tell you about the role women have played in tiki. I cannot, because that’s not just one tidy article. The scope of the impact of women in the history of tiki is vast. It’s also buried. Instead, I’m going to share an inner dialogue that is always, always running around in my head, because we have to start somewhere. Where would tiki be today without Sunny Sund? Did you know that Don the Beachcomber was owned, operated and expanded by a woman? Donn may have been a genius… or he may have paired up with one in Sunny. Or both. We’ll never know what the world would have looked like without Sunny there to not just keep his business going during World War II, but grow it. He became a household name on her watch. During the heyday of Golden Era Polynesian restaurants, the ’50s and ’60s, women didn’t have financial freedom that today we take for granted. Women could not secure lines of credit without a man. (Stories from women who are unable to secure venture funding for their business until they bring a man onboard are sadly still common in Silicon Valley today.) If you were a woman with a vision of owning your own Polynesian restaurant, you needed a man just to be able to operate your business, even if he was only there on paper. So you have to do a bit of reading between the lines when you hear of old restaurants that were owned and operated by a husband and wife team. The male beachcomber host was a common trope, and women were presented as mere set dressing, a mystery girl holding a flaming drink bowl in an ad. By our cultural conventions, the husband is the one listed first in news articles, the one the newspaper reporter would ask all the questions. (Even today at our home tiki bar, guests will turn to my husband Rich and ask how he built the tiki bar. He did not build the tiki bar. Our cultural wiring is hard to break.) If you dig deeper, sometimes you’ll find evidence of the truth, usually from the mouths of the employees years later: husbands who were merely along for the ride, there to secure funding and play the paper host, while the wife was the visionary, the one who actually ran the whole operation. This happened across the country. And today it continues: I’ve heard folks many times say that Tiki Oasis is put on by Otto von Stroheim, but it’s not. It’s put on by Otto and his wife Baby Doe, they are a team. I’ve only ever seen her listed second, and it wouldn’t surprise me in the slightest if she actually deserves top billing. There could not be a Tiki Oasis without the hard, heavy work by Baby Doe von Stroheim. Beachbum Berry’s Latitude 29? Wouldn’t exist without his wife Annene. And I don’t mean that in a she-supports-him way. He’s the face, she’s the operation. Would the Mai-Kai have survived without Mireille Thornton? Eli Hedley famously helped decorate the Polynesian restaurants all around southern California in the ’40s, ’50s and ’60s… using flotsam and jetsam collected from the ocean at San Pedro by his teenage daughters. The Hukilau is one of the rare cases of a woman front and center in tiki: it was started by a team of folks, but it was Tiki Kiliki who grew it into one of the most beloved annual tiki experiences. Many of today’s powerhouses of tiki bartending are women: Mindy Kucan, Marie King, Erin Hayes, Shelby Allison, Suzanne Long, Rebecca Cate (who doesn’t sling herself, but you betta believe Smuggler’s Cove wouldn’t exist without her hands and brain on that bar), and I don’t doubt there are tons more—the bar industry is only starting to learn to shine light on women. So the next time you see some trite celebration of the “titans of tiki,” an art piece that seeks to immortalize key players in history, or capture a scene with the major modern players in tiki represented… take a closer look. Ask yourself why you’re seeing so many men, and so few women. We’ve always been here, not just keeping tiki running, but making tiki what it is. History hasn’t kept our stories well. We need to challenge each other to do better. Thank you so much for this story. So true. My husband and I are the perfect example to your point in that every time we meet someone and tell them we make wine, it is always my husband who they turn to and start asking winemaking questions. He is always gracious and defers to me, though and says that he is just my lowly ol’ cellar rat. With that said, we really appreciate all the work you put into Critiki! My Mai-Kai book profiles several great women. And the book was edited by my wife. I recently spoke with Sunny Sund’s daughter who said her mother was a bigger part of Don the Beachcomber’s from further back than anyone has known yet. That story is largely unknown. Too much of her history was written from the view of Donn Beach, who was on one side of a divorce, and that obviously skews his narrative. Love this article. As a grown woman who fell in love with tiki at age 5, it’s really nice to hear about the women behind the scenes. Time to come out! Thanks for a most-needed article, Humu! 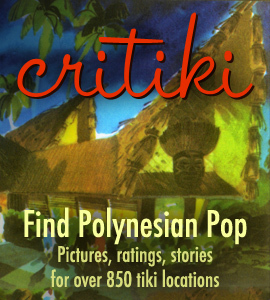 You are one of the most incredible supporters and sustainers of tiki. Where would we be, without Critiki, Ooga-Mooga, Balhi Ha‘i, your tiki seminars for bartenders, tiki websites far and wide, TC, and your friendship over almost two decades? Big shoutout to Ms. Helenini of WAITIKI 7 for her awesome musicianship as Exotica’s premier violinist! I happen to know that everything you have said is correct about Cora. I saw and owned proof. Great article it made my eyes mist and than be proud to be a woman.